New research is looking into the cells that block, or allow, frightening memories to pop up into our minds. Image credits Henry Gray / Anatomy of the Human Body (1918) via Wikimedia. Researchers at The University of Texas at Austin have identified the group of neurons that handle scary, recurrent memories. The findings could help us better tailor therapy for the treatment of anxiety, phobias, and post-traumatic stress disorder (PTSD). Drew and his team worked with a group of lab mice, which they trained to associate a distinctive box with fear. Each mouse was repeatedly placed inside the box and given a harmless electrical shock until they started associating this box with feelings of pain. Needless to say, this rendered the mice quite scared of having to go inside said box. The end result was that the mice would display fear when inside the box. In the second step of the experiment, the same mice were placed inside the box without receiving the shock. They kept displaying fear initially, the team reports. However, as exposure to the box continued without the shock being administered, the association weakened. Eventually, the mice stopped showing signs of fear. The authors explain that repeated exposure without the painful shock created extinction memories in the mice’s minds in place of the earlier, painful and fear-inducing memories. This is a glimpse of how our brain stores and handles conditioned responses, a process which has been heavily studied and documented ever since Pavlov and his drooling dogs. However, there are still things we don’t understand. Among these, and something the team wanted to understand, is how and why memories or responses we thought were behind us can still pop up in our minds, triggering spontaneous recovery (think of it as a form of traumatic-memory relapse). In order to find out, they artificially activated fear responses and suppressed extinction trace memories through the use of optogenetics (a technique that uses light to turn neurons on or off). Drew’s team was surprised to find that the brain cells responsible for suppressing or allowing fear memories to surface are nestled in the hippocampus. The traditional view is that fear is born of the amygdala, the primitive ‘lizard’ level of our brains. 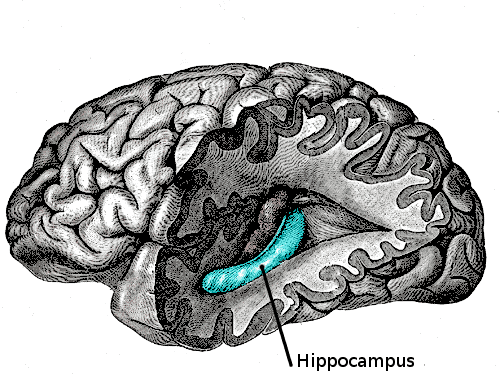 The hippocampus is actually heavily involved in aspects of memory, but generally in the process of linking memory with spatial navigation. The team’s hypothesis is that the hippocampus’ job is to provide spatial context for memories, i.e. where something happened or how you got there. Their findings could, therefore, explain why exposure therapy — one of the most common treatment avenues for fear-based disorders — sometimes simply stops working. Exposure therapy works by creating safe (extinction) memories to override the initial, traumatic one. For example, someone who’s scared of spiders after being bitten by one can undertake exposure therapy by letting a harmless spider crawl on his hand. While the approach is sound, the team reports, it hinges on our hippocampus‘ willingness to play ball. “Extinction does not erase the original fear memory but instead creates a new memory that inhibits or competes with the original fear,” Drew said. The findings suggest we should revisit how we time exposure therapy, and how frequently patients should undergo exposure sessions, according to the authors.